Democratic presidential candidate Pete Buttigieg, the mayor of South Bend, Indiana, was in Boston to speak at Northeastern University. Pete Buttigieg is on a roll. With well over a dozen other Democrats in the mix for the 2020 presidential race, he is managing to raise money and get noticed. More than 1,000 people turned out to see the mayor of South Bend, Indiana, speak at Northeastern University. Buttigieg also happens to be one of this month's hottest Democratic presidential candidates, having raised $7 million this past quarter. He surged in the polls and impressed voters with his responses to some of the most controversial issues. "For those of us who live in a state that is blue or red, that is small, medium or large, the electoral college is a dumb idea," Buttigieg said of election reform. On achieving net zero carbon by 2030, Buttigieg said he doesn't view it as a decision to be made by Congress. "I view it as a decision that's already been made by science," he explained. "The right year to achieve those carbon goals was yesterday. And the only question is, 'How fast can we do it?'" Just 37 years old, Buttigieg is a Harvard graduate and a Rhodes scholar able to speak seven languages. He responded in Italian to a question by an Italian reporter. 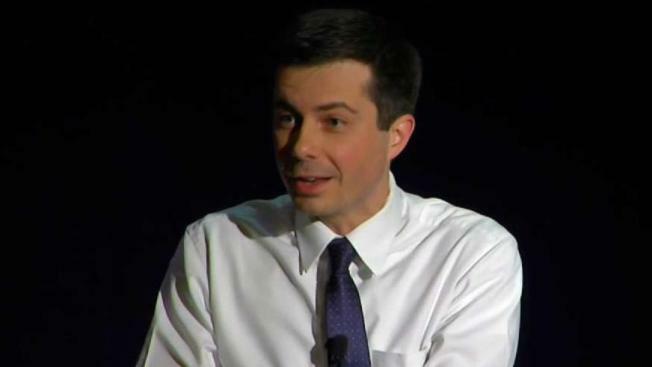 Buttigieg is a lieutenant in the Navy reserve, a former management consultant, and he is gay. Now married, he explained why it took him till his 30s to come out publicly. "I'd been dragging my feet on coming out because my two careers were military and elected office in Indiana, neither of which is super gay friendly," he said. Put it all together and it is a profile that resonates with millennials. And voters in general are even starting to learn how to say his last name.